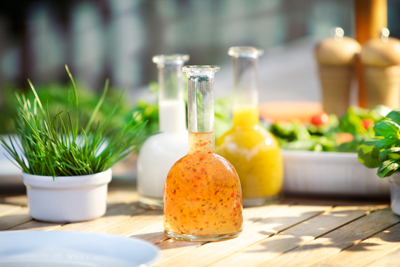 Clear dressing with herbs for salads are generally made with water and vinegar and no oil. Different vinegars (balsamic, red wine, cider etc) can be used as well as fruit acids (citric, raspberry, orange zest etc) alongside flavourings such as finely chopped garlic, onion and chives. Because they contain no oil then no emulsion is created. The bottle is designed to be shaken to remix the dressing just before use. Some clear dressing with herb products contain thixotropic stabilisers to retain some suspension and deliver some mouthfeel. Our technical team can advise you on how to create a new clear, no oil, salad dressing which will maintain a suspension of herbs and garnish prior to bottling. To achieve this we use a thixotropic pectin solution which takes the place of the water. Vinegars and flavoured ingredients can be added to this solution which will maintain their suspension. The solution lightly gels in the bottle but is still visibly liquid. The bottle shaking is just to break the gel so that the product flows on to the salad before resetting again in the bottle. The light gel is not perceived as a gel in the mouth but as an enhanced mouthfeel. Talk to us today about how we can help you bring your new product to market. Some problems can arise when producing a new clear salad dressing with suspended herbs and other flavourings in the bottle. Our technical team can advise you on all of these – and how to avoid them! Tha main issue can be taste. Sometimes the product can taste tart in the mouth and needs buffering – however, buffers raise the pH which can be regarded as a compromise to food safety. However, there are buffers which combine with water to form acetic acid in a set ratio called the dissociation constant. Thus acetic acid is always present to kill the bacteria (It is acetic acid which penetrates the bacterial cell wall not the hydrogen ion concentration or pH). KaTech can supply suitable buffers for your clear salad dressing and explanations for their use. If you are experiencing issues with your product, get in touch today, we would be glad to help and offer our advice. With recipes containing water, vinegar plus various herbs and spices it can be difficult to generalise on cost optimisation. The main consideration would be to ensure that the various garnishes are held in suspension prior to bottling so that an homogenous product is delivered to the bottle for uniform taste with no wastage due to settling in the batch tank or splash spillage. Contact us today for help and advice on reducing your costs.